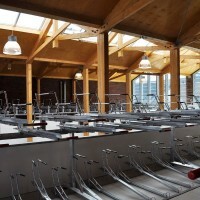 Nunc Architects designed a warehouse for parking bicycles in Zaandam, The Netherlands. 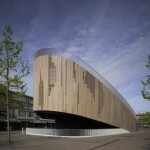 Designed to release the pressure on the public space of the main shopping avenue of Zaandam, the fietsenpakhuis accommodates a daily storage of 700 bicycles. 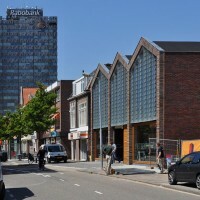 Due to a overwhelming popularity of bike use in the Netherlands, many town centers suffer congestion of the public domain. 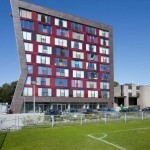 In Zaandam inhabitants are stimulated to leave the car and travel by bike. 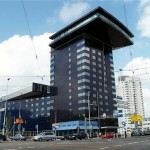 In the golden age Zaandam functioned as the industrial area of Amsterdam. 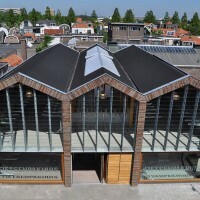 Goods were traded in Amsterdam, and refined here. Back then with the massive use of over 600 windmills. Later steam and electricity took over, leaving the Zaanstreek with a fascinating naturally grown landscape of huge factories and small wooden houses standing side by side. 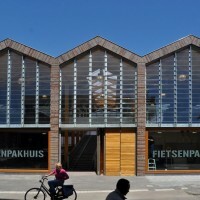 The design of the Fietsenpakhuis is inspired by the archetype of the “Zaanse” warehouse. 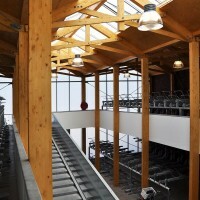 An expressive wooden structure of beams and columns supports the building and is enclosed by a shell of brickwork. 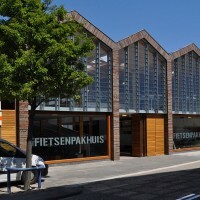 The Fietsenpakhuis is designed as a public space, inviting all cyclists to enter. 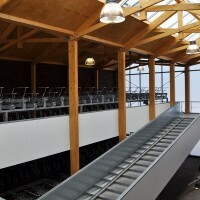 A huge folding door that opens completely gives access to a double-height open space with a gently inclined staircase leading to the upper floor. 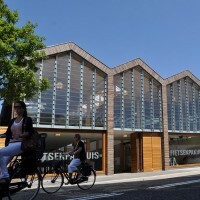 The street facade is transparent showing off the main function of its existence, the stored bicycles. 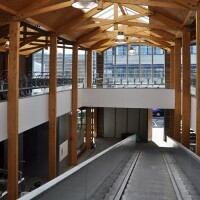 The ground floor is paved with bricks, visually connecting the outer street with the interior. 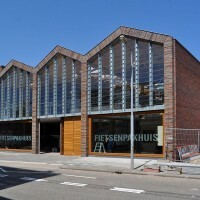 The glass panels in the street facade are stacked in overlap referring to the wooden claddings as seen on regional barns and houses since the 17th century. 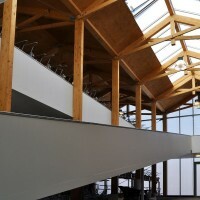 The transparency of the facades as well as the roof lights allows daylight to enter. On ground level a big window reveals the workshop of the mechanics. 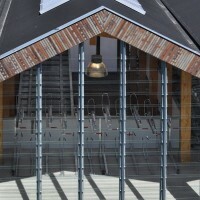 They control the free entrance of the parking, and handle the other functions; public toilets, bike repair, renting out bikes and lockers. 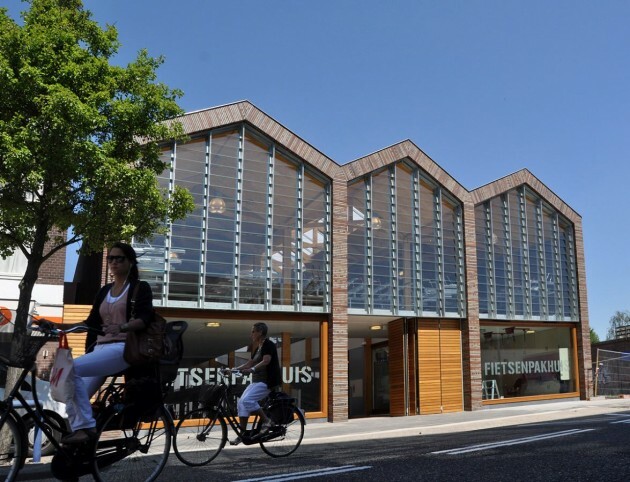 The Fietsenpakhuis is sustainable in many ways. Fewer people travel by car. 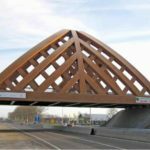 Materials are locally won, the wood used on structure and roof is certified. 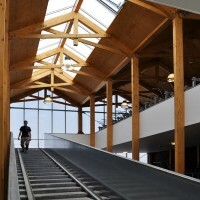 The building is using passive solar heating and is naturally ventilated. 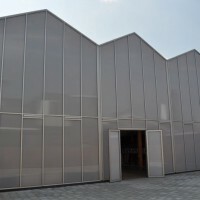 Electricity is generated by using solar panels on the rooftops providing almost all energy needs, keeping the ecological footprint of the building to a minimum. 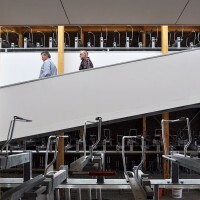 Visit the Nunc Architects website – here.